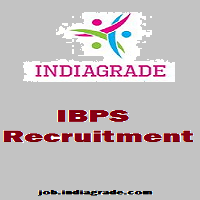 IBPS Recruitment 2015: The Institute of Personnel Banking Selection(IBPS) is conducting the Common Written Exam(CWE) for Specialist Officers, PO/MT, Clerical, RRBs entrance examination for recruitment of various candidates. The IBPS is the premier organisation which may conduct the employment test, selection and management on behalf of human resource in India. Our INDIAGRADE(job.indiagrade.com) will provide the upcoming notification by IBPS through our Facebook, Google +, Twitter page. Keep watching this page regularly for more updates about latest recruitment in 2015. Candidates can may apply through online online mode. Their will be single registration for both Preliminary and Main exam. Payment will be made only through online(Debit Card, Credit Card, Internet Banking, IMPS, Mobile Wallet, Cash Card). Applicant may have to enter name, address, education qualification, age limit, father's name, mother's name, cast etc. Finally submit your filled registration in the official IBPS site(www.ibps.in). IBPS will release the online examination admit card after the registration process is completed. So candidates those who apply for IBPS exam successfully they can easily download the IBPS hall ticket 2015 as a pdf format. The direct link to get the upcoming examination admit card is given below for your reference. Once the online exam finished participated candidates can download the IBPS Answer sheet 2015 from our official www.indiagrade.com website. We will give the IBPS question paper along with answers quickly with compare to other private sites. It can take some time for IBPS to releasing the results. You can check result after one or two month through the internet. INDIAGRADE will need some suggestion from you. Please comment your question below, we will update the all details such as question paper, syllabus, exam pattern as soon as possible.